Organic raw unfiltered apple cider vinegar (ACV) that is. This pantry must-have has been coined “Mother Nature’s perfect food” due to its natural medicinal properties. ACV is a naturally occurring antibiotic and antiseptic that fights germs, bacteria, mold, and viruses. Besides just mixing it with water, it serves many other purposes that promote overall wellness. I’ve compiled a list of 8 ways you can use apple cider vinegar that extends beyond what you may normally use it for. Aids in weight loss. Studies suggest that apple cider vinegar aids in weight loss as it may suppress your appetite and help balance blood sugar. Keeping blood sugar levels stable, prevents excess fat from being stored. Apple cider vinegar is high in is acetic acid which has been shown to decrease body fat accumulation and increase nutrient absorption. Aids in digestion. Apple cider vinegar is alkaline-forming, which helps neutralize your stomach acid (over or under producing acid leads to digestive issues.) If you suffer from acid reflux don’t reach for antacids, instead try this natural solution. One tablespoon of apple cider vinegar and a glass of water will do the job; drink it before each meal. Natural energy booster. In today’s fast-paced world, the first thing you reach for to help boost your energy is coffee or an energy drink. Instead mix 2 teaspoons of apple cider vinegar plus 2 teaspoons of raw honey for a natural energy boost. Apple cider vinegar has a potent supply of potassium in addition to enzymes and minerals that helps fight fatigue. Vegetable Rinse. Skip the expensive Veggie Wash’s and opt for a natural solution. In a large bowl add vegetables plus 1-2 tablespoons of apple cider vinegar and let it sit for 5-10 minutes. Use a vegetable brush to scrub the dirt, pesticides and bugs that get trapped and may be unseen by the eye. Rinse and enjoy! Toner. If you are looking to improve your skin’s complexion naturally, ACV is the way to go. 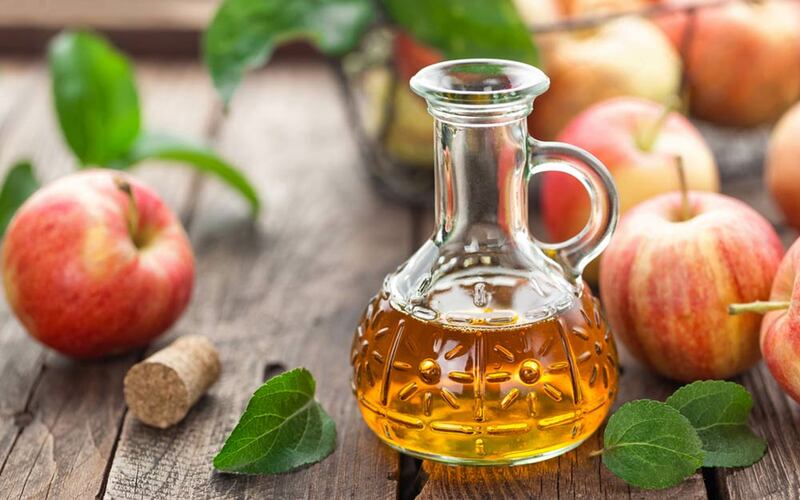 Apple cider vinegar balances out your skins pH level, improves acne and scars and helps minimize appearance of pores. Dilute 1 tablespoon of apple cider vinegar with two cups of water and dip a cotton ball into the solution and apply to your face. Relieves Sunburns. If you suffer from a bad sunburn, just simply add a cup of ACV to your bath and soak for about 10-15 minutes. Enjoy healing! Detoxifier. ACV aids in removing mucus from the small and large intestine (especially when combined with psyllium husk) and in pulling toxins in your intestinal tract. The acetic acid in ACV fights off bacteria, fungus and Candia that may wreak havoc on your digestive system. Normalizes blood pressure. As mentioned earlier, studies suggest it lowers blood pressure due to the acetic acid in ACV. Studies also suggest that ACV contains a powerful antioxidant, quercetin, which has also shown to lower blood pressure. Pair 1 tbsp. of ACV with water two to three times daily to reap the benefits. For an added bonus, add a tablespoon of raw honey to increase the mineral and enzyme potency. I want to hear from you, comment below! Have you ever used Apple Cider Vinegar as a natural remedy?